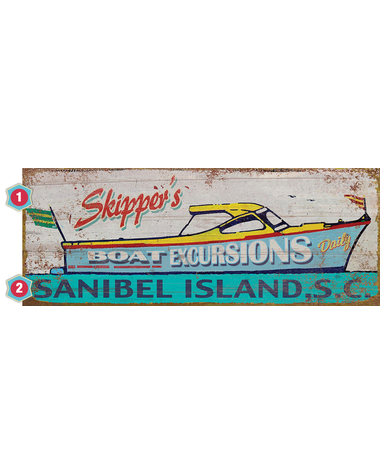 If you enjoy taking your guests for "real estate tours" around your lake, our Boat Excursions Sign is the ideal addition to your lake house decor. It's available in two sizes, and you have a choice of planked wood or metal. Customize this bright piece of art with your name and lake! Our daughter gave us this sign personalized with the name of our lake house and we love it!!! The name of our house is lengthy ... " Mullins Lookout". However, they did a fabulous job fitting it on the upper part of the sign. This left the lettering area at the bottom for the lake name. Perfect!! I've had several friends request info on the company that produced this wonderful gift!! !